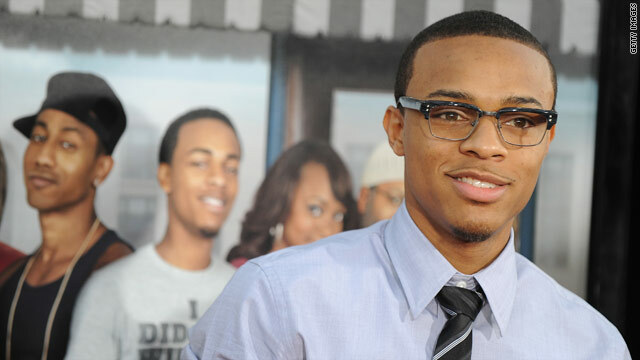 Bow Wow arrives at the premiere of "Lottery Ticket" in the Hollywood. (EW.com) -- Shad Gregory Moss hasn't gone by the name Lil' Bow Wow for some time now. But if you squint hard enough and try to ignore the barrage of broad African-American stereotypes in his latest film, "Lottery Ticket," it's easy to see that the former pint-size Snoop Dog protégé has grown into a likable leading man. In this frenetic, family-friendly riff on the Friday formula, Bow Wow plays Kevin, an honest, hard-working high school grad who lives in an Atlanta housing project and punches the clock selling Air Jordans at the local Foot Locker. That is, until he realizes he's holding the winning ticket in a $370 million lottery. After his loose-lipped, Bible-thumping grandma (Waiting to Exhale's Loretta Devine) spills the beans about his imminent payday, a flood of characters (or, to be more accurate, caricatures) cozy up to him to get their cut. Gangsters, gospel preachers, gold diggers -- Kevin sees through their greed and ulterior motives. But not before going on a wild spending spree that would make Pretty Woman proud. The problem is, music video director Erik White's blue-collar fantasy wants to have it both ways: For every well-intentioned speech Kevin gives about the lottery being a rigged game designed to keep poor folks down, there's a montage of him giddily blowing wads of cash on sneakers and sports cars. If "Lottery Ticket" had as much conviction as laughs, it could have hit the jackpot. © 2011 Entertainment Weekly and Time Inc. All rights reserved.